The Bangor High football team had a second half to forget in the State title game against Cheverus. Well, their Basketball brethren got revenge, knocking off defending-state champ and undefeated Cheverus to win the Class A Boys State title, 56-49. Bangor got off to a hot start, scoring 9 straight points in the first quarter after Cheverus got out to a quick 3-0 lead. Tristan Thomas had 5 points in the opening quarter. It was Bangor up 9-3 after the first quarter. The Stags had 13 turnovers early in the second quarter, and only 3 points. The Stags would turn it around, however, going on a 15-6 run, led by Griffin Brady's 10 points in the second quarter. Patrick Stewart paced Bangor with 6 points in the quarter, as the Rams were up 21-20 at halftime. Brady kept it going to start the second half, scoring 4 points in a 6-2 Cheverus run. Cam Olson pitched in 4 points late, as it was 34-31 Stags after three quarters. 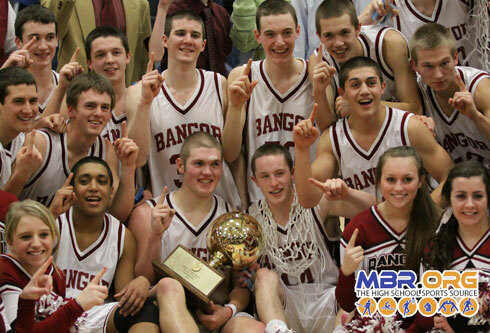 Bangor was determined to not lose to Cheverus in two state titles in one year. Luke Hetterman, the smallest player on the Bangor roster, put his team on his back in the fourth quarter. Hetterman hit an astounding 9 free throws to push Bangor to victory. Hetterman finished with a team-high 14 points, all in the second half. The Bangor senior was named the Capt'n Eli's Player of the Game and had a dream end to his high school career, being lifted in the air by his team after winning the State Title. For Bangor, revenge is sweet.